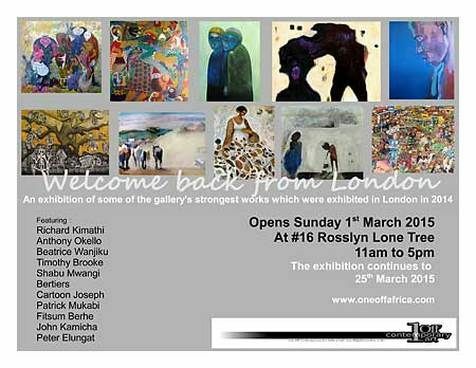 A chance to see work by artists represented by the One Off Contemporary Art Gallery that was shown in London in 2014 at the Gallery of African Art, 9 Cork Street. Oil paintings by 11 well-known Kenyan artists are on show, as well as metal cut-outs by Patrick Mukabi made from houses that were destroyed in the violence following the 2007 general elections. Address 16 Rosslyn Lone Tree Estate, off Limuru Road. 16 Rosslyn Lone Tree Estate, off Limuru Road.